Stamp it up, some more! 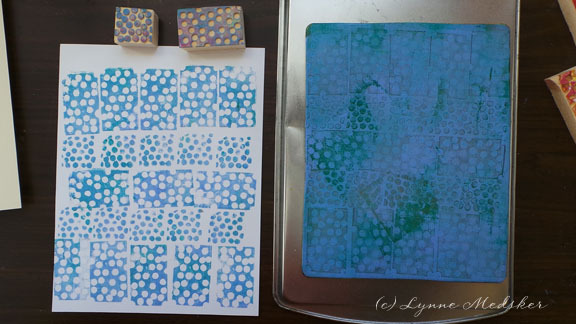 On Tuesday’s post I showed you how I made some stamps to use with my gelli plate. 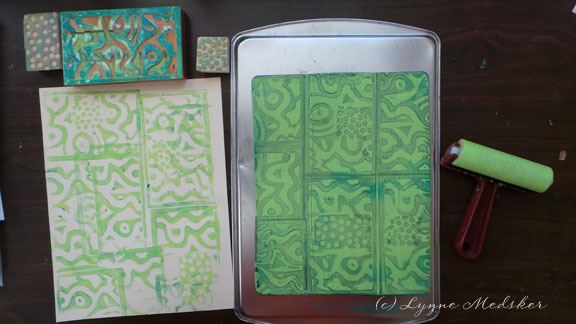 Today I thought I’d share some of the results once the stamps were dry enough to play with. These were all stamped on card stock, some white and some buff colored. Here we go…. 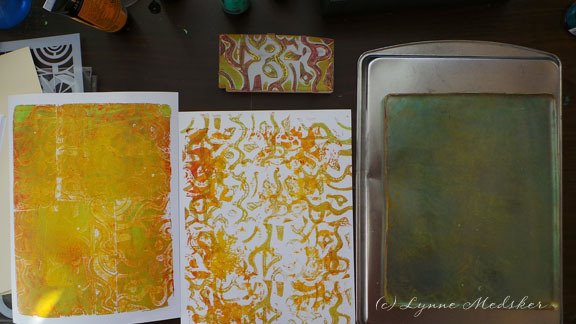 First I used my brayer and a couple of orange/yellow/red acrylics and rolled them all over the plate. 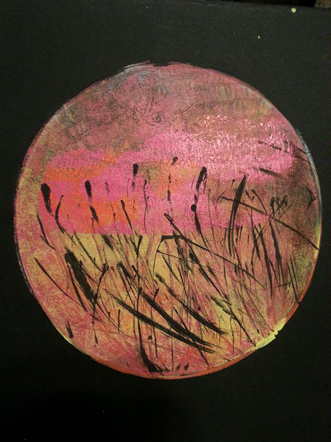 Then I stamped the dot/hole stamps on the gelli plate and printed them directly on the paper from the stamps until I’d covered the entire play and most of the paper with a random design. I pulled the first print on a new sheet of paper without putting a lot of pressure on the paper since there was plenty of paint on the plate. 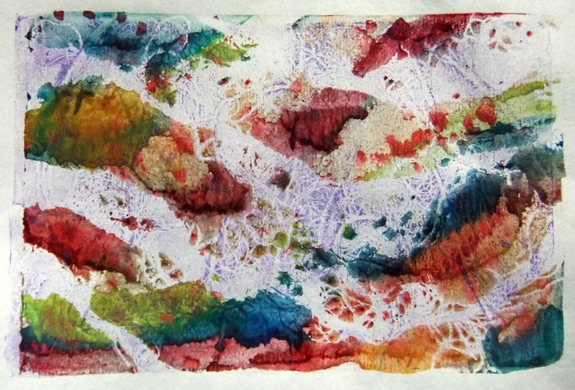 Here is another series using the same process with different colors & stamps…. 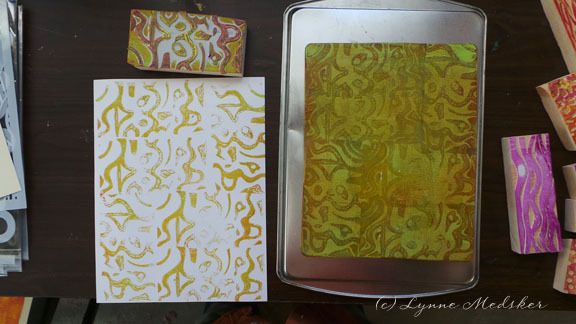 At the end of the session I ended up with some very colorful stamps and some nice prints too! Due to a scheduling conflict (and a delay on getting running water installed!) the first workshop in my new studio has been pushed back until October 18th! All the details are below, the only change is the date. 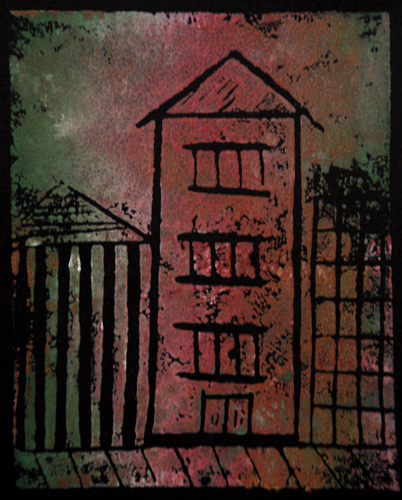 I hope that you can attend, I’m anxious to have some printmaking fun with you! 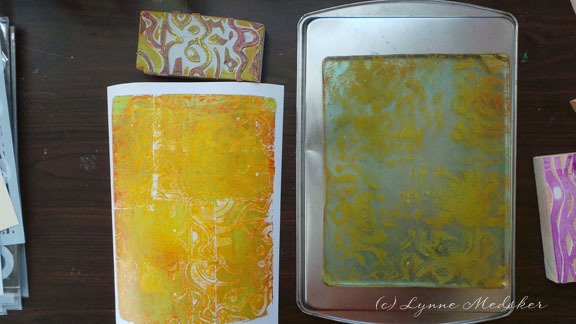 Saturday, October 18th join me for a fun day of exploring printmaking on gelli plates. 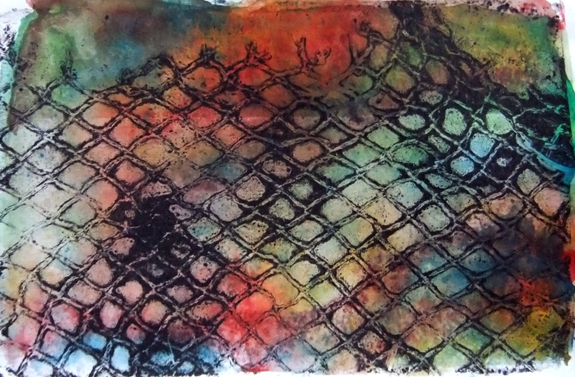 Come prepared to be messy and to leave with LOTS of prints! 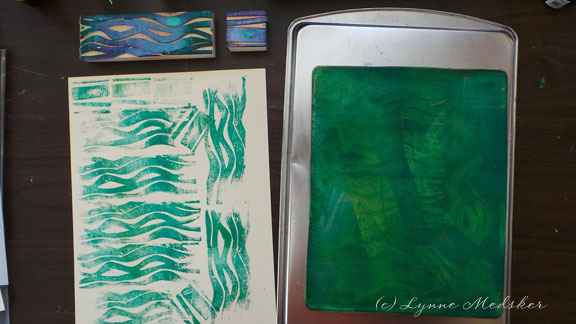 This simple, press-free, method of printmaking is great fun and hard to stop once you get started. I’ll provide all the materials, some tips & techniques and a bit of guidance along the way – you provide the enthusiasm! 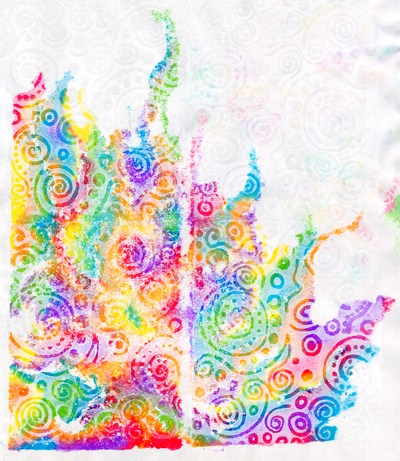 If you’ve wanted to try this fun art form this is a perfect way to check it out before you purchase any supplies. 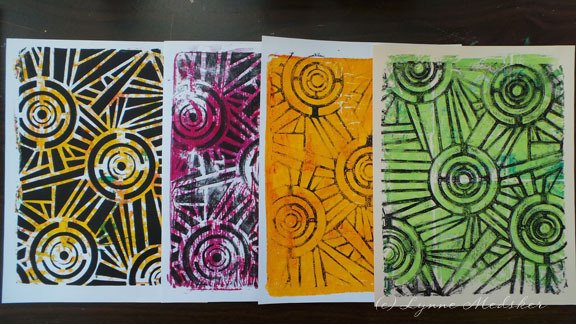 If you enjoy it as much as I do the plates will be available to purchase at a reduced price at the end of class so you can continue printing at home. We’ll start at 10 a.m. and continue to play until 4 p.m. that day. I’ll have coffee and pastries available in the morning and ice tea and cookies in the afternoon, as well as bottled water all day. Bring a lunch with you (I have a refrigerator and microwave in the studio) so you don’t have to leave during the fun! To allow each person a lot of space to spread out and work I am limiting the class to four students (note: I have two signed up already!) so be sure to sign up soon! Cost per student is $95. Register online at www. lynnemedsker.com on the “Online Registration” page under the “Instruction” tab. I can’t wait for this fun day to get here! It’s finally time for a workshop in my new studio! 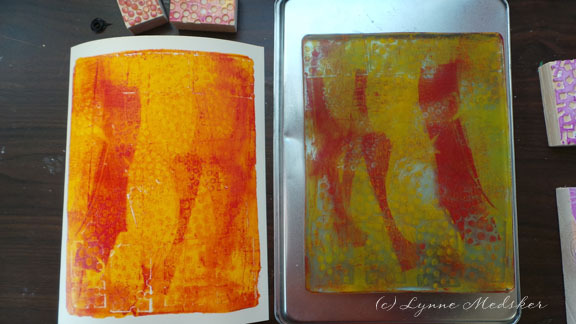 Saturday, October 4th join me for a fun day of exploring printmaking on gelli plates. 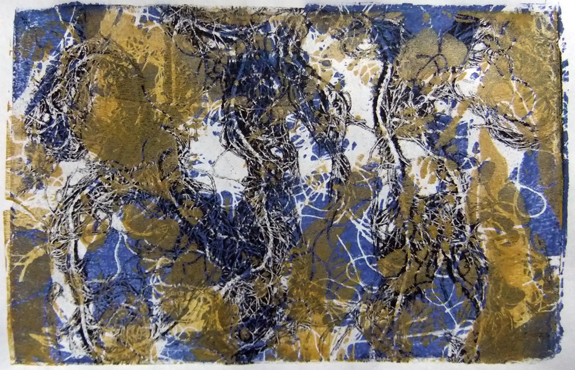 Come prepared to be messy and to leave with LOTS of prints! 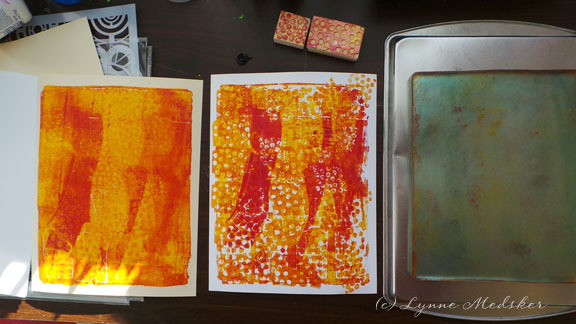 This simple, press-free, method of printmaking is great fun and hard to stop once you get started. I’ll provide all the materials, some tips & techniques and a bit of guidance along the way – you provide the enthusiasm! To allow each person a lot of space to spread out and work I am limiting the class to four students so be sure to sign up early! Cost per student is $95. Register online at www. lynnemedsker.com on the “Online Registration” page under the “Instruction” tab. 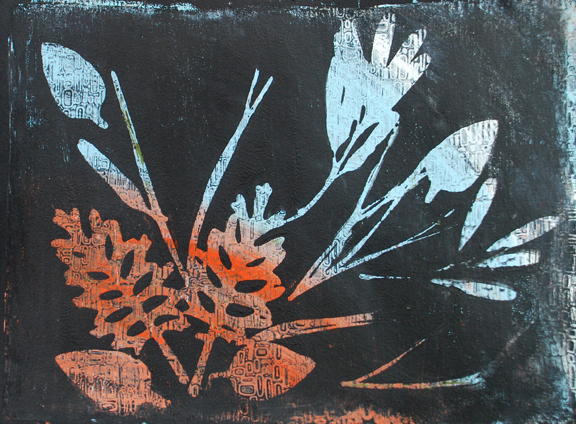 I am going to go right now and find a spot on my calendar and mark it in bold letters: EXPLORE PRINTMAKING! Look for some newness in the next month. 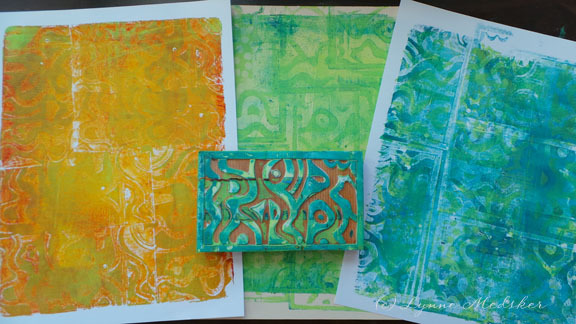 These are a few of the new prints I created when I had my open studio/play dates last month. It was fun just playing again and I really like the textures in these pieces. I may use them for something else or some of them may stay exactly as they are, it’s hard to say at this point. 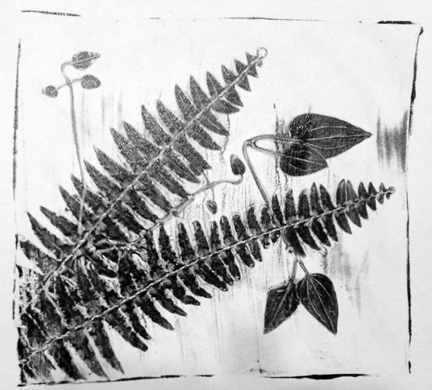 I had a total of 11 visitors come by and play with gelatin prints during the open studio times! 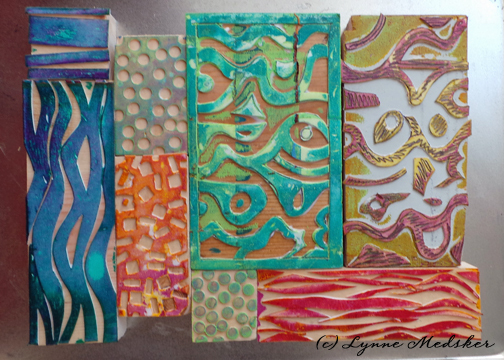 It is always so fun to see how others create using the same materials and processes, I’m always amazed. 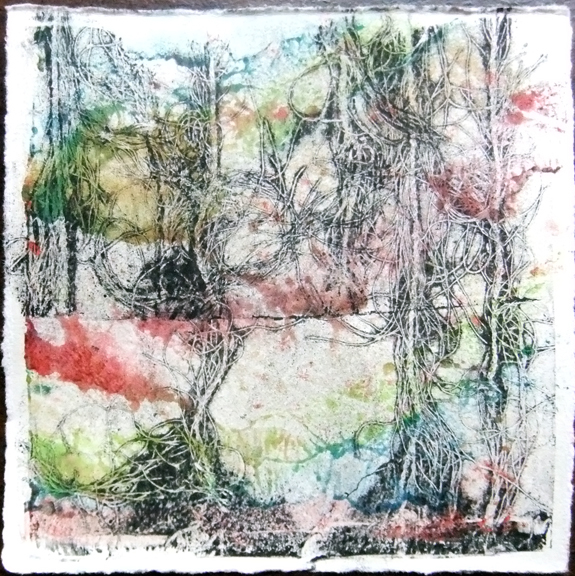 I plan to have more open studio play dates in 2012 – stay tuned for details! 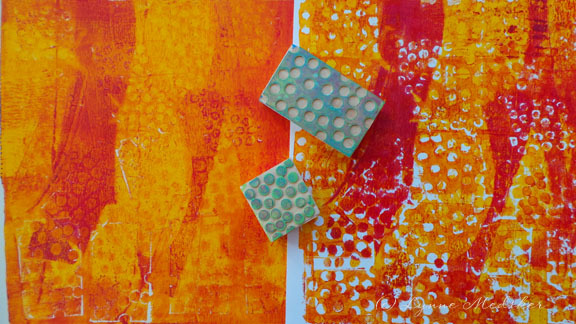 REMINDER: Open Studio Days: Printmaking Play! Wenesday, December 7th 1 p.m. to 6 p.m.
Thursday, December 8th 10 a.m. to 4 p.m. / 6 p.m. to 9 p.m.
Friday, December 9th 10 a.m. to 4 p.m.
Feel free to drop by the studio and join me any of those days, or all of those days. 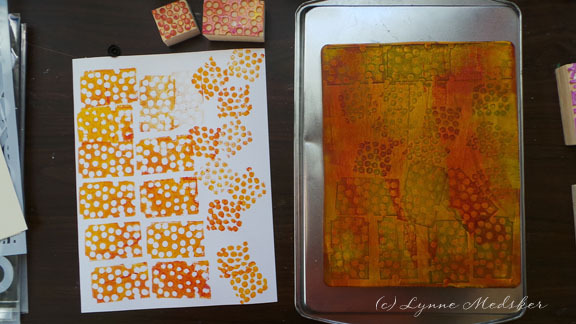 I’ll have plenty of gelatin plates, ink & paints ready for us to experiment with, as well as block & foam printing and other goodies to try. 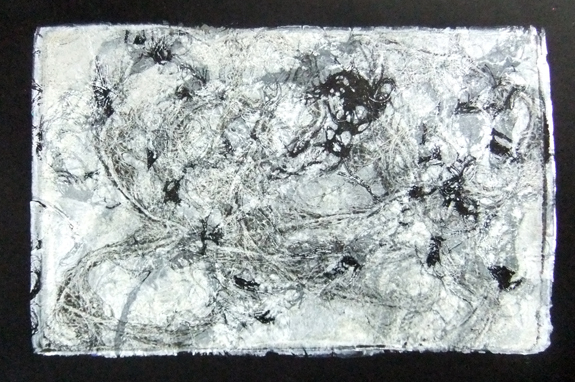 To learn more about the process, read this blog post. Since my studio space isn’t huge I’d appreciate you emailing me and scheduling your studio time so that I can keep the sessions moving smoothly. Feel free to bring friends and, by all means, share this post! There is no fee but you are welcome to donate a few dollars for the supplies if you are so inclined.